This had all the makings of a really cool film. An entire film set in the bleak future finally showing us the human war against the machines of Skynet sounded awesome, the fact that it was led by fanboy icon and the rescuer of the Batman franchise, Christian Bale, was all the more reason to get excited. Unfortunately this film seems to be influenced by the Bourne movies, as many action movies have the past decade. Terminator Salvation is a dark gritty action flick, which means it doesn’t really fit in with the rest of the franchise at all. While the others were certainly action movies, they did have a certain tongue in cheek aspect to them and there were moments of levity that distracted you from all the chaos going on. Salvation has none of that light-heartedness seen in previous installments, and I feel like the film is weaker because of it. The fourth Terminator film is set in 2018 (which is only 3 years away for those paying attention). The machines have attacked the humans after Skynet has become self-aware. John Connor (Bale) is a soldier in the human resistance. He is looked upon as some sort of messiah by some humans, but the guys in charge think he is a looney tune. Connor sways more humans when he is able to predict the creation of a more superior terminator, the T-800 model. He obviously knows this because he met one as a kid when it travelled back in time to protect him, but nobody else needs to know that. As the humans set out to destroy the machines using a new EMP bomb they’ve created, the human resistance is thrown into chaos when a human looking cyborg is rescued from the field. His name is Marcus Wright (Sam Worthington) and he has no memory of how he ended up in the year 2018, or how half his body became robotic. The humans, particularly Connor, suspect Marcus to be a sleeper agent sent by the machines to kill John Connor. 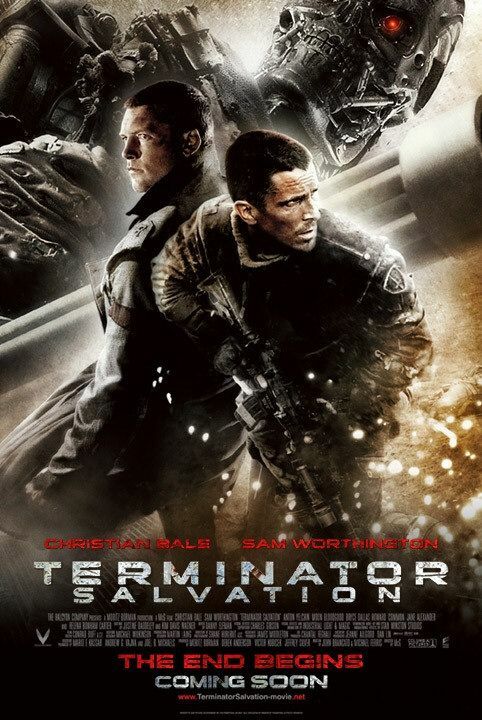 John is forced to work with Marcus as he knows the whereabouts of Kyle Reese (Anton Yelchin), the man who would become Connor’s father in the first terminator movie. The two must work together to find Kyle and get him out of a machine stronghold before the humans enact their plan to destroy all of the machines using their new bomb. This movie made more press because of a Christian Bale rage episode that was recorded and leaked to the press. I am hesitant to hate Bale too much because of this. We don’t know the specifics of how the whole episode occurred. For all we know, this clumsy set designer was getting in Bale’s way all day and he finally snapped. I’m not making excuses for Bale, I’m just saying nobody but the people on that set know what happened that day. It is unfair of anyone to judge him when we don’t know the facts. That being said, the recording didn’t sound good. There really isn’t much more to say about this film. It is marginally better than the terrible third installment. But by creating a dark and gritty cookie cutter action film has taken away any sense of originality that this world had. The film is also sorely lacking the presence of Arnold Schwarzenegger, his big screen charisma and machismo would have added some much needed fun to this story. Sam Worthington tries hard, but he is no substitute for the Austrian Oak. Arnold’s T-800 does appear later on in the film, but it is not really him. Someone has used CG effects to digitally put Arnold’s head on someone else’s body. Arnold himself has said he didn’t wait to appear in such a small role as the audience would feel cheated. I tend to agree with him. Well, this wasn’t fun at all. Terminator Salvation differs greatly in style from the three previous films. The Terminator was dark, but full of suspense that left me on the edge of my seat. T2 was a straight up action film, but with a good dose of humor thrown in to break up the seriousness. T3 kept the same tone as T2— it wasn’t completely successful in it’s attempts, but you can tell they’re related films. But Salvation? This is a gritty, dramatic look at the post-Judgement Day world. It looks nothing like the previous films in the series. There’s no humor, no suspense, and the action is very stale. It feels more like a reboot than a continuation of the franchise. It makes sense that a movie showing a world barely holding itself together after nuclear war would be dark, dreary, and serious. In that sense, Salvation mostly succeeds (the humans running around look a little too healthy and well nourished, but let’s ignore that). But the problem is that there’s so little fun to this story. Even Terminator, which is the darkest of the previous three, was still fun to watch. There were touching moments between Sarah Conner and Kyle Reese, and of course, there was Arnold Schwarzenegger. (Arnie did not reprise his role in this film. He’s instead portrayed by a body double and CGI trickery.) This installment has very little of the spark that made the first two movies entertaining and unique. It doesn’t even have the aesthetics that made the third movie fit the series’ continuity. Salvation feels like an entirely different movie rather than a part of a series. For me, the biggest problem was that I didn’t really care about this part of the story. I don’t need to know how the Terminators came about, especially when I’m given only a glimpse of the T-800. I want to see them endlessly going back in time to try to beat the humans. (Now is a good time to mention that Salvation has no time travel. Boo.) I suppose the story was always leading up to John Conner’s life as leader of the Resistance. Still, it’s just not as fun watching him in action as one would hope.